With the aim of showing you all the benefits and features of our MacRes System, we have just made available a new video about its installation process. 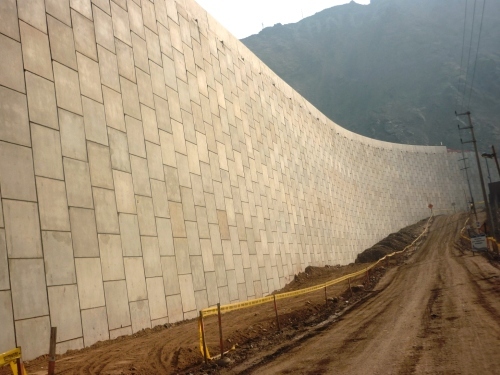 The MacRes MSE System is a Mechanically Stabilized Earth (MSE) retaining wall system comprised of precast concrete facing panels and discrete high adherence polymeric soil reinforcing strips. The soil reinforcing strips, which are the key structural components of the MacRes MSE system, utilize high tenacity coated polyester strips, commercially known as “ParaWeb”. ParaWeb consists of discrete bundles of closely packed high strength polyester filaments, lying parallel to each other, encased in a tough and durable polyethylene coating. ParaWeb reinforcements have been used for many years in MSE wall as a geosynthetic alternative to steel reinforcements, due to its chemical stability and its low creep characteristics. The soil reinforcing strips are mechanically connected to the facing panels through a specially designed connection. In this mechanical connection, the polymeric reinforcing strips are wrapped around a steel rebar (anchor bar) embedded into the concrete facing panel. The rebar is encased in a polymeric sleeve to provide steel corrosion protection and to prevent damage to the polymeric soil reinforcing strips due to the friction. The performance of the MacRes MSE system depends primarily on the interaction between the soil reinforcements and the surrounding “reinforced backfill, MSE backfill, or select granular backfill”. External stability includes assessing the safety of the MSE structure against sliding of the MSE mass on the foundation soils, eccentricity of the MSE mass, and bearing capacity/deformations (vertical and lateral) of the foundation soils under the MSE mass. External design of the MSE structure requires the knowledge of the strength parameters of the retained, reinforced and foundation soils, which are typically provided by the project Owner (i.e., Department of Transportation). The project Owner is also responsible for all surface and subsurface drainage details, analysis of the foundation soils’ for bearing capacity and settlement, as well as global slope stability of the MSE structure. Internal stability includes assessing the safety of the structure against rupture and pullout of the soil reinforcements, as well as internal sliding along the interface between the soil and the reinforcements. Internal design of the MSE structure requires the knowledge of the long-term and short-term strength properties of the soil reinforcements and the interaction parameters between the soil and the reinforcements. Since the MacRes system utilizes extensible geosynthetic soil reinforcements (i.e., ParaWeb polyester strips), the calculations of the internal stresses (vertical and horizontal) in the MSE structure follow the AASHTO Simplified Method per AASHTO 11.10.6.2.1. To learn know about our Retaining Walls and Soil Reinforcement applications, do not hesitate to contact us.